Brandon Ewing will be hosting a fundraiser for former Poke Weston Johnson to help him fight melanoma on April 19th in Laramie. Brad @ WyoNation: Since you left Laramie what have you been up to? How’s life been treating you? Brandon: Well since I left Wyoming in 2009 I have been playing ball professionally overseas and also one year in the d league. I actually won Guard Of The Year in Cyprus Greece and scoring 51 points in one playoff game. I’m actually living in Laramie now rehabbing my groin and getting my body healthy to make this NBA run. This summer everything I do will be dedicated to making the NBA for this upcoming season. I have a really good chance of making an NBA roster this year so my focus is at an all time high. I work out every morning and night in the AA. Brad @ WyoNation: You had a run in the NBA-D league with the Iowa Energy, and then some ball overseas. What was life like in the D-League? How does overseas basketball compare? Is there a large adjustment between basketball in the United States vs. Europe? Brandon: There is a big difference in how the game is played overseas than the NBA. The NBA is pure talent and 1 on 1 ability in some situations and Europe is a team game! Scoring 12 points in Europe on a top team is almost like scoring 20 in the NBA. Brad @ WyoNation: You’re back in the US now.. what are your plans? NBA? Brandon: I’m really dedicated to making the NBA so my friends and family can watch me play and the ultimate goal is to make the Denver Nuggets so the school can attend some games as well. 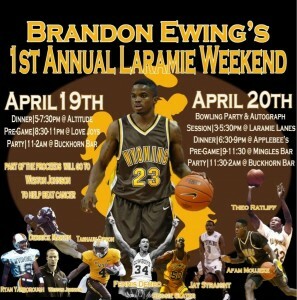 Brad @ WyoNation: Down to business.. you’re back in Laramie and hosting Brandon Ewing Weekend.. tell me about it. Brandon: The official name for it is the 1st Annual Brandon Ewing Laramie Weekend which will consist of a Dinner party at Altitude Friday from 5-730… Drinks at Love Joys from 8-11 and party at the parlor from 11-2am… On Saturday night we will have a bowling party at 3-6pm with autograph session and pictures and also a raffle for a limited Wyo bowling ball… After is dinner at Applebee’s from 730-930 … Drinks at Mingles from 930-1130… And the last party at the parlor from 1130-2am. Brad @ WyoNation: You’re having a “who’s who” of former Wyoming athletes join you for the event. Who has committed to making an appearance? Brandon: Ryan Yarbrough, Fennis Dembo, Theo Ratliff, Tashaun Gipson, Eric Platt, Afam Muojeke, Ryan Dermody, Reggie Slater, Derrick Martin, Jay Straight, Justin Williams, Donta Richardson, Many More and over 70 former students as well. Brad @ WyoNation: What inspired you to host this event? Brandon: I am in the works with all the venues that a percentage of the money will go to help Weston Johnson beat this Cancer. Me and Weston were in the dorms together and is a good friend of mine so I will do ANYTHING to help my friends and family out. I didn’t want to do the typical basketball game. I wanted to build the bridge between athletes and regular day to day students. I was never the type to think I was above anybody because I was an athlete. I look at us all as equals and having one common bond as being Wyoming Cowboys and Cowgirls. So I would love for everybody come out to have a good time. I would love for all of us to team up and help Westin beat this cancer!! And what better way than to have a good time doing something great for one of our great players. Thanks to Brandon for interviewing with me and I’m happy to help spread the word of this great event to help Weston Johnson out. Also be sure to check out the auction for Weston being hosted on the Sheridan Media website and this helpful info on how to donate to the cause by following this link. Be sure to check the WyoNation forums for further updates on this event, and how to help Weston. Go Pokes! WyoNationDotCom looks great!!! Thank you for that!! B_Ewing No prob. I’ll retweet it out again today, and next week as well. Brandon – way to go!! See you there on the 19th come hell or high water!! What a great way to promote cowboy”ism” You are a true leader and an inspiration to others – I would not call you a former cowboy – I would call you the quintessential cowboy!!! And Brad thats not at all a digger on you – its just that Brandon really represents what being a Wyoming Cowboy should be!! BradReed GeorgeRoberts – good…cause I loved the article!! 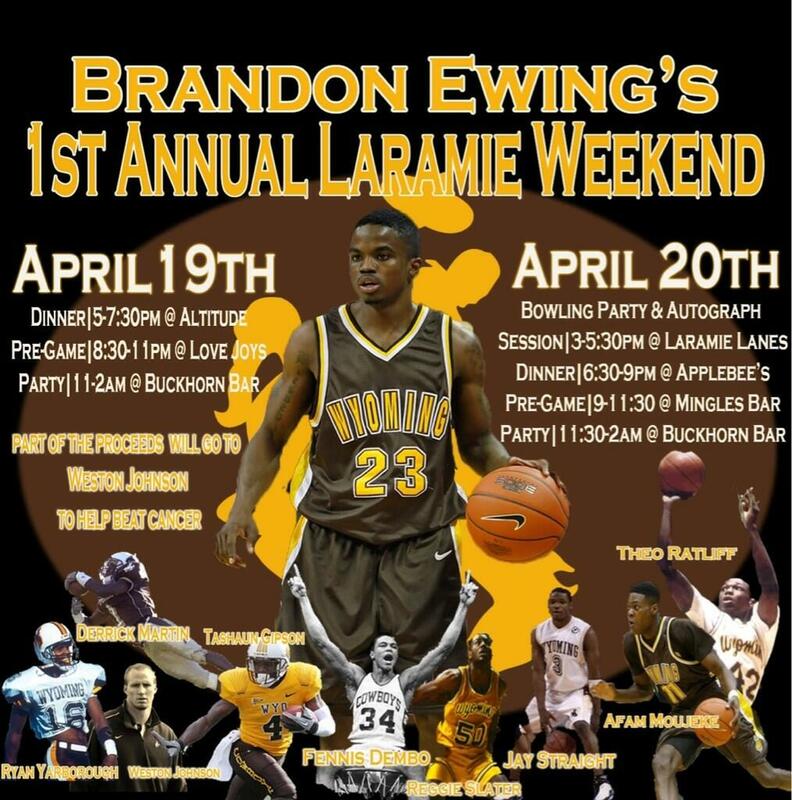 B_Ewing pretty dope u holding this fundraiser in Laramie my dude. B_Ewing I would love to bro but I gotta work both days, all day. B_Ewing ya bro. Wish I could be there. Gotta make that money tho. B_Ewing will do. Let me knw it turns out. Is Theo gon be there?